Today we are excited to present the BIG monthly Blog Hop that Papertrey Ink hosts for all of it's talented customers to show off their skills! The Blog Hop is an ALL DAY EVENT! A new link list will be posted here on my blog at 10am EST and you can add your link anytime up until 11:30pm EST. And don't worry if you aren't going to get a chance to make a project and play along, there will be a contest for non-participants as well over in our forum in the designated thread. I hope that I will see many of your familiar faces over here today! I look forward to seeing all of your creativity! All of our customers who enjoy sharing inspiration & artwork with their peers through their personal blogs. The actual Blog Hop will take place today, October 25th, beginning @ 10am EST. You will explore individual blogs through a thread here, on my blog, beginning at 10am EST today. A day dedicated to seeking inspiration through projects utilizing Papertrey Ink products. For this month's blog hop inspiration we've selected something with a bit of an autumn flair. 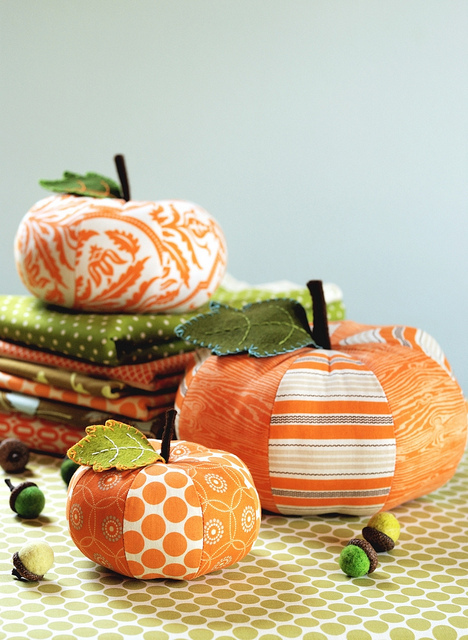 The fabric selections and pattern combinations used on these petite pumpkins are a prime way to jump-start a fabulous fall paper project. Use the colors as your inspiration, or perhaps focus on the patterns You can also utilize pumpkins or maybe some felt die-cut leaves. Whatever you choose, you are sure to have amazing results! We look forward to seeing your projects! -Participating bloggers can add their link to the appropriate list here anytime between 10am EST and 11:30pm EST today, October 25th within the link list that will be posted.The title of your post should be "Papertrey October Blog Hop Challenge". -The three random blogger participant winners will be announced Wednesday morning on our forum and highlighted here on my blog! -You can enter our Blog Hop Forum contest. There will be a special thread posted in our forum specifically for this purpose asking a question. Please only post once, as the winner will be picked via the Random Number Generator. The forum contest will end at midnight EST and the winner announced in the morning within the thread. -Create a project while you are here, using the new inspiration you have gathered from the Blog Hop. You can post your projects in the gallery, even if you do not have a blog! We are looking forward to all the fun a bit later today and we hope to see you there! Good post! I like it.